The only president never elected president or vice president liked to deprecate himself as “a Ford, not a Lincoln”. And while he was president, the National League representative of his favorite city was definitely no Big Red Machine. 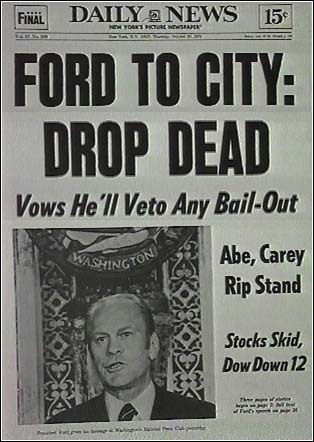 From the day Gerald Ford took the oath of office until the end of the final baseball season of his presidency, the New York Mets compiled a record of 192 wins and 186 losses. Here’s to President Ford, a .500 or so chief executive uniquely suited to the .500 or so life and times that defined not just our ballclub but our country in the mid-1970s. An interim manager thrust to the helm of an outfit in dire need of steady, reassuring guidance following an age of tumult. Low-key in a town chock full o’ self-promoters. Universally liked by those with whom he served. Probably not destined to keep the job all that long no matter who begged his pardon. Made a nice run there toward the end. By all accounts, by whatever standards one chooses to interpret the won-lost record, a good and decent man. As presidents go, Jerry Ford wasn’t a Lincoln. He was America’s very own Roy McMillan. – He was followed by a guy who brought great hope and a new way of doing things, but who sadly didn't get to accomplish nearly as much as he might have. – The guy after him was perceived as clueless, but he had amazing skills as a communicator and everybody loved him despite his faults. I think that's enough. Unless one of YOU can come up with a good Poppy-Joe Frazier parallel. Though he held the top job and they didn't, Cobra Joe Frazier brings to mind pols in the vein of John Connally or at least Fritz Hollings. The smart money was on them. The smart money was wrong. I'm a lifelong Democrat, and I mourn his passing. That in itself is a testament to what a decent man he was. A real gentleman who put the nation's need for healing above its need for revenge. Good qualities in a president, I'd say. And woefully rare, especially these days. Rest in peace, President Ford. I'm pretty picky about my presidents, and you were always a favorite. And Mike Cubbage never should have given that interminable inaugural address in such bad weather. The man wasn't a great president, but he was, by all accounts, a good man. The world is poorer without him. After working 14 hours on the Ford story today, I brought my children down to the museum today to sign the condolence book. He was a very good man wh held his own in a job he never sought in conditions no one could ever have imagined.